Your people came to you with solutions instead of problems. Collaboration was the order of the day rather than dissension. Profits were strong and increasing year after year. These are the promises of a Profit Improvement Process initiative. Here are sixteen myths, secrets and pieces of insider’s information about cost reduction and profit improvement that will help you succeed in maximizing your profits. Are these true or not and what are the secrets to success? World-class profit initiatives are impossible to achieve. Suggestion programs are the way to go to reduce costs and improve profits. Employees always volunteer their best ideas. It costs a lot to engage a profit expert. Cutting costs to improve profits will hurt sales. If an idea will save a lot of money or make a large contribution to profits we should just do it no matter what. All we really have to do is tell our managers to cut costs. An informal program is just fine. Reducing cost will have a negative impact on quality. Only for-profit organizations will benefit. Only large companies will benefit. Profit Improvement Processes only work for manufacturing companies. Speed in profit growth comes from getting a quick start. We can start with just middle management support. 1) Myth: World-class profit initiatives are impossible to achieve. 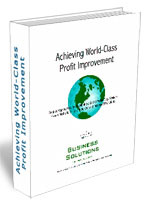 World-class profit improvement results are difficult to achieve but not impossible. Secret: See what it takes to have world-class standards with this easy to take free on-line evaluation. It will give you a list of what characteristics define world-class initiatives. 2) Myth: Suggestion programs are the way to go to reduce costs and improve profits. There is no doubt that employee suggestion programs can play a key role in the communication structure of an organization. They do not however tend to produce large or sustainable increases in profits. Studies show that participation in the US tends to be very low. Secret: Build structure and process around a profit-focused system to maximize success in both the short and long-term. 3) Myth: Employees always volunteer their best ideas. Employees will volunteer ideas until they run into the usual barriers to innovation found in most organizations such as criticism, lack of opportunity, lack of support, and other intervening priorities. Secret: It actually takes a significant amount of training to diminish the impact of these barriers and provide employees with the tools for overcoming them. 4) Myth: It costs a lot to engage a profit expert. The reality is that a good profit consultant will help you accelerate and expand your profit growth beyond what you can do on your own. Yes, a Six-Sigma program takes about $250,000 and six months just to get started at a small company but you can do a lot better with the alternatives. Secret: Consult with any potential consultant in advance of engagement. A good consultant will discuss your needs and opportunities in advance with no obligation to give you a good idea of what you should do. Business Solutions – The Positive Way will even conduct a preliminary two-day Power Idea Session with your key staff that is guaranteed to produce at least $50,000 in profit projects. This session will make you money while you evaluate your options. What a deal! 5) Myth: Cutting costs to improve profits will hurt sales. Actually this is NOT a myth! A focus on cost cutting invariably will hurt sales. It is almost impossible to keep the up enthusiasm and spirit that are absolutely necessary to revenue growth when all you are doing is cutting and cutting. Secret: A balanced approach with a view toward all three elements of the profit equation (revenue, expense, and loss) will not only safeguard profitable revenues but will help you build additional revenue streams as an integral part of Profit Improvement. This approach builds enthusiasm and spirit to build a positive outlook for the future. 6) Myth: If an idea will save a lot of money or make a large contribution to profits we should just do it no matter what. It is a mistake to make cost reductions or other major changes without carefully evaluating the impact against the criteria that are important to your organization. The end may not justify the means. A cut may look good for the moment but damage the organization later…as many corporations have found when they cut too many people in reengineering programs only to stunt their future growth and profitability. Secret: Establishing clear criteria for cost reduction and profit improvement that are consistent with the overall objectives of the company can keep you on track with both growth and profits. This is an integral part of the Profit Improvement Process. Test your knowledge of what really qualifies as a profit improvement idea. Is that gold or fools' gold? 7) Myth: All we really have to do is tell our managers to cut costs. There is no question that properly motivated and led managers will do their jobs to the best of their abilities and you will make progress. The reality is that they will run into a brick wall sooner or later. Secret: Providing your leaders with tools and processes will empower them to go far beyond where their innate abilities and experiences will take them. It’s like everything else; people with training, practice and skills win. 8) Myth: An informal program is just fine. Informal programs usually do generate some savings but they tend to miss less obvious opportunities and slow down. You don't even know what you're missing. Secret: Continuous success comes from well run Profit Improvement Processes that fold into the culture of the organization and become a natural part of everyone's objectives. Improvements build on each other to enable unforeseen benefits. Further, formal programs ensure that opportunities are evaluated for fit with corporate culture and needs. 9) Myth: Reducing cost will have a negative impact on quality. A well-run cost reduction program uses your quality criteria as a measure of what changes can and should be made. Quality should improve when you remove the costs of low quality, as will costs and margins. Quality and profit improvement programs are synergistic. Continuous Improvement Programs can combine the elements of cost and quality. Secret: A focus on the cost of quality (loss) as a part of the profit equation in a Profit Improvement Process will ensure that quality improves along with improved margins. 10) Myth: Only for-profit organizations will benefit. Even not-for-profit organizations can greatly benefit from a well run PROFIT IMPROVEMENT PROCESS. Organizations that control their costs are able to use more of their resources to deliver the services that they are charted to provide. Resource contributors as well as consumers appreciate efficiency. Expense ratios are often used as one measure of an organization's capability. Secret: Organizations of all kinds that use Profit Improvement Processes are generally more efficient than those that do not. Use a Profit Improvement Process to make sure your organization is not-for-profit on purpose. 11) Myth: Only large companies will benefit. Profit Improvement Processes are ideal for even smaller organizations that do not have the staffing to implement more pervasive and dramatic systematic change systems. Profit Improvement Processes are a great way to start organizational improvement. Secret: You can build a program that will meet precisely your needs that fits the size of your company. Use something like the Profit Improvement Process that is flexible enough for companies from $10 million to $10 billion in sales with a cost/benefit ratio to match. 12) Myth: Profit Improvement Processes only work for manufacturing companies. Any operation that has an expense structure can benefit from a Profit Improvement Process. They work everywhere where the participants and stakeholders can accept them. Secret: A well-designed and flexible process can apply in any type of business. The key is to fit the process and the tools to your needs. We found tens of millions of dollars in annual savings and profit improvement in an insurance company. 13) Myth: Programs have to be complex: Even the largest organizations can benefit from simple Profit Improvement Processes. Programs are tailored to the culture, size, and complexity of the organization. Secret: Simplicity of process is a key to the ability to install and maintain an initiative over the long term. There are a number of different approaches to consulting and programs compared here. 14) Myth: Speed in profit growth comes from getting a quick start. This is actually true to some extent but with real limitations. It is true that delay can be deadly. On the other hand, progress is usually determined by how well the initiative is structured and managed. Secret: Training and education are critical to success but these are often left behind in the need for speed. Plan for them to happen as soon as possible. 15) Myth: We can start with just middle management support. The reality is that a lack of top management support is the number one reason for failure of any initiative – including cost reduction and profit improvement initiatives. Secret: Top management must be engaged. It is best to engage them from the start. But, given no alternative, try a test in a single department or business unit with a plan of using the demonstrated results to win over top management. A flexible and skilled consultant can help you do this. 16) Myth: Programs must be fully installed before they produce results: Not infrequently, the program will be started with a core team or representatives from selected departments and skills. That team will focus on target areas and refine the process while creating savings. Once the process is working, they can help lead the broader effort. Join hundreds of companies that are using the information provided in "Achieving World-Class Profit Improvement" and start saving your company thousands of dollars in the first few weeks. You can cut cost and improve profits immediately. Order Now and start cutting cost and improving profits for your company. World-class cost reduction and profit improvement resources.